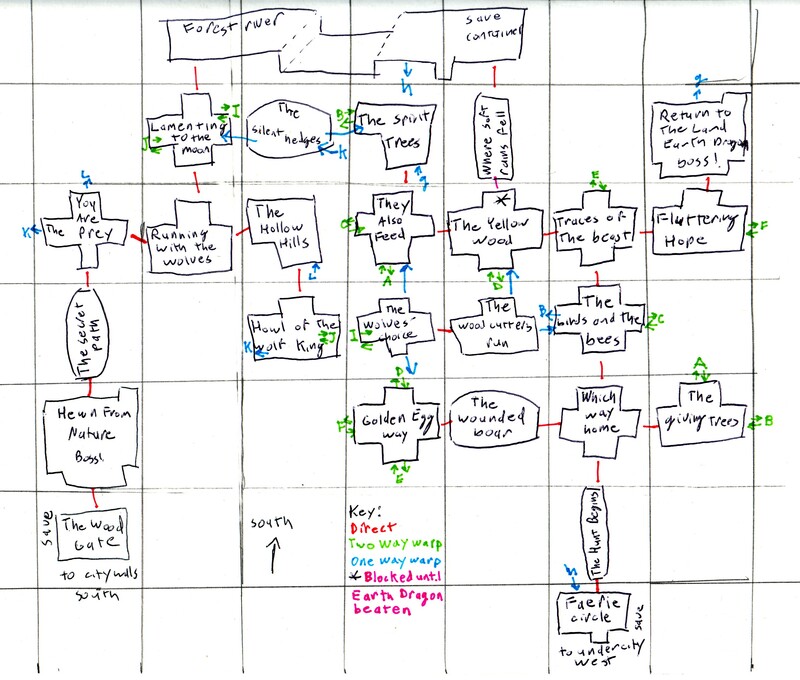 Having modern games automatically map their dungeons for you as you progress through them certainly is convenient, but doesn't seem as though something is missing as a consequence of that? That there is some aspect of adventure and role playing gaming that once existed but doesn't any longer? Vagrant Story usually has a built-in map for convenience. But it manages to retain some mazes that the built-in map does not obviate. The Snowfly Forest achieves this by subverting the map with warps. You can still use the map to keep track of where you are at any instant, but if you don't take notes on the map you might not be able to find your way. Indeed, without mapping, your experience in the snow fly forest might resemble being lost in a real forest. "Haven't I seen this before? I think I'm going in circles!" I first beat this game in 2000 or 2001 (at least 9 years ago), so I probably don't have my original notes. These maps were made when I replayed the game in 2010. At first, the second half of the forest will be blocked off until you beat the Earth Dragon boss. 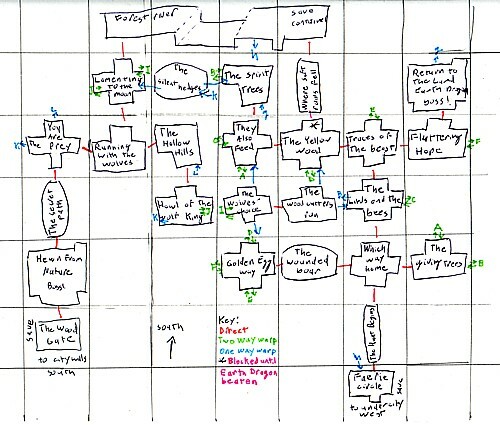 This map focuses on this part of the game. After that, you will have access to the complete forest, as shown in this map. As shown in the key on the larger map, orange indicates a direct connection between adjacent rooms, green is a two way warp between separated rooms, and blue is a one way warp (which you cannot immediately return from). Here's some more clarification. You'll notice in the first map that "The Spirit Trees" and "The Giving Trees" are connected by a two way warp point, B. However, "The Birds and the Bees" also has a one way warp point to B. How does that work? Since the one from "The Birds and the Bees" points left, it must lead to a room that you enter on the right. In other words, it leads to "The Giving Trees". Likewise, in the larger map, the one way K warps from "You are the Prey" and "Howl of the Wolf King" both lead to "The Silent Hedges". The larger map also has unlabeled one way warps. These always lead to the adjacent room. 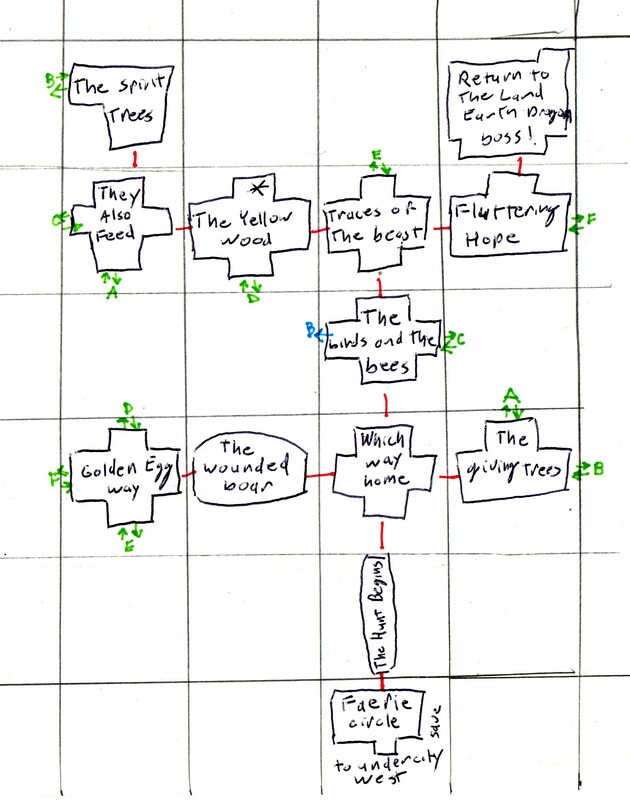 So, if you go up (south) in "The Woodcutter's Run", you'll end up in "The Yellow Wood". But if you immediately go down the same way you entered, you'll take the D warp and end up in "Golden Egg Way".